Al Sadd Sports Club Doha (D1) agreed terms with 26-year old American guard Russell Byrd (201-93kg-92, college: Michigan State). He started the season at Island Storm in Canadian NBL. 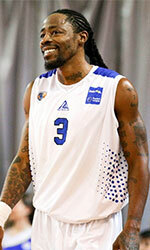 In 17 NBL Canada games he had very impressive stats: 18.0ppg, 7.2rpg and 3.5apg this season. The most of last season Byrd spent at St. John's Edge in Canadian NBL Canada where in 20 games he recorded 5.8ppg and 1.9rpg. He helped them to end the regular season as a second best team in NBL Canada Central Division. They also advanced to the league semifinals. Byrd also played for Titans in NBL Canada. In 15 games he averaged 12.9ppg, 5.5rpg, 2.4apg and 1.1spg. Byrd graduated from Michigan State in 2014 and it is his fifth season as a professional player.